This recently finished, beautifully decorated studio casita, Casita Aguacatal, sits in an idyllic, lush tropical garden with a large outside deck from which to enjoy the views down to the Lake, volcanoes and active bird life. Perfect for 1 person or a couple looking for a retreat-like experience in one of Lake Atitlan's most popular villages and close to restaurants and the lake shore. Casa Aguacatel is the perfect Get-Away! The casita was just recently completed with the loving care of its owner. It is in the grounds of Casa Grande ( although both houses very much have their own privacy). These two houses can be rented together. Please ask for more details. Surrounded by a lush, fantasy garden, you can sit sipping your coffee watching the hummingbirds and looking down to the Lake and volcanoes beyond. This is a perfect get away for a writer or artist needing a quiet, tranquil space in which to work or for those who just need some well-deserved R&R! The main room is carefully designed to be spacious and light with a queen-size bed, well-equipped kitchen, a large bathroom with an elegant bathtub plus a view to die for! Outside is a large wrap-around covered veranda or deck providing a whole other 'outside' living room again with views down to the Lake. Santa Cruz is only accessible by boat. The Bookings Manager can help with all transport and transfers to the Lake and across to Santa Cruz. Guests will be met at the Santa Cruz public dock by the caretaker to show them to the house and carry luggage. The caretaker works Mon-Fri and on weekends, if necessary, to meet you and check you in. And there is a maid to clean the studio once a week. Your Bookings Manager is lives on Lake Atitlan and available if you need assistance at any time during your stay. The sounds of the birds, the view of the volcano across the lake, the beautiful gardens, the privacy, the tranquility were exactly what I was hoping for. 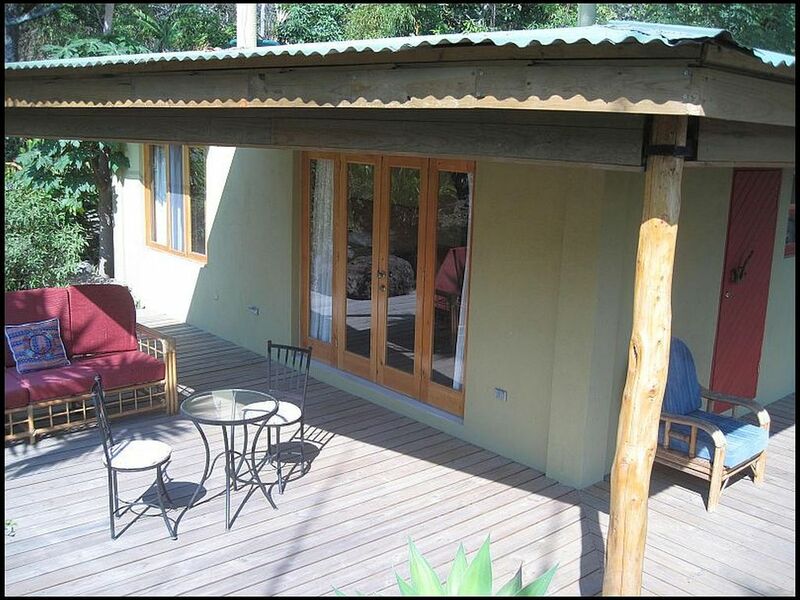 The casita is modern and comfortable and has a lovely warmth and charm. And Carlos, the guardian, was always close by in case I needed anything. I felt totally safe and secure and would love to go back... this time for longer than the two weeks I was there. I loved walking the dirt and stone paths to get to the village and restaurants. And it was always a treat to get back to the casita and the quiet.